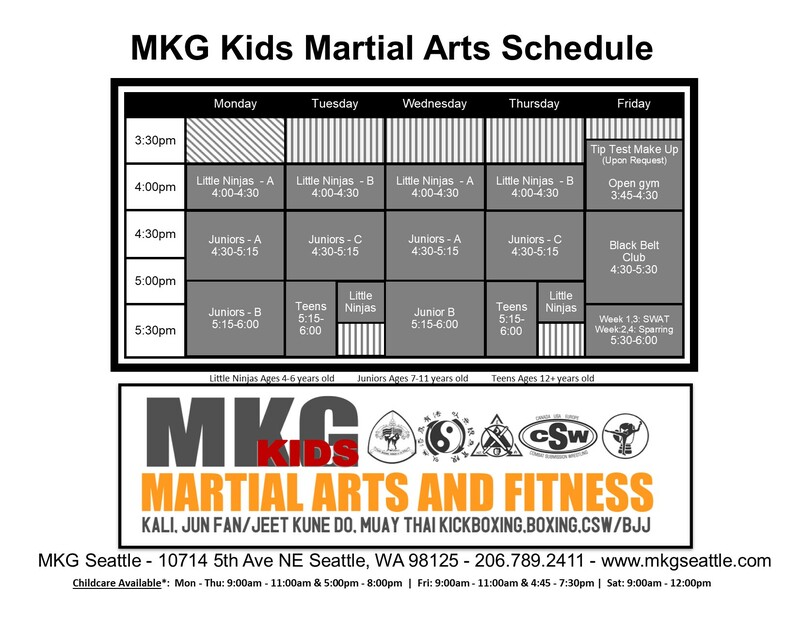 We’re very happy you’re exploring Kids Martial Arts at MKG Seattle! Get started with some helpful information below! Ready to get started? We would love you to join our community. For instant access and 50% off our web special, click the button below. We’ve compiled a few items suggested for your intro and essential for all your Kids Martial Art classes at MKG. Click the button to learn more! We offer one of the most diverse set of classes taught by highly trained Martial Art instructors. Come check out our school in North Seattle. We’ve compiled a few items suggested for your child's intro class and essential for all your Kid's Martial Art classes at MKG. Patience and respect are really important. All kids learn at a different rate and our instructors will do our best to make you and your child comfortable. Don't worry. We'll be there to help and make sure you have as much fun as possible. Our kids martial arts classes train in barefeet. Please do not allow your young ones to walk on the mats with their street or school shoes. It's impossible to keep mats completely clean but this goes a long way! All kids are given a uniform that is required to participate in class. This is very important for learning the martial arts we teach and creating a proper learning environment. Our classes are only 30-60 minutes but kids may want a quick sip of water. We provide water coolers to fill up your bottles, so no excuses. Not required for first time members. When you first start we will provide gloves and kali sticks if needed. At our school, we also have community pads to share for begginers. As you advance, you might want to purchase your own gear/ gloves/ pads/ sticks from either our North Seattle shop or online. If you have any questions, ask us. We are here to help you thrive! Special offers available... We have tried many different enrollment options over the years but the best deals are available the same day as your first lesson. Come prepared. We have many options to choose from. Classes in our Kids Martial Arts program are offered at the following times. If this fits your schedule then jump into one of our classes! Questions? Call us at (206)789-2411 or request more info below.